10 A None No Power Seat 10 A is a standard Premiere Class seat. 10 D None No Power Seat 10 D is a standard Premiere Class seat. 10 G None No Power Seat 10 G is a standard Premiere Class seat. 10 K None No Power Seat 10 K is a standard Premiere Class seat. 11 A None No Power Seat 11 A is a standard Premiere Class seat. 11 D None No Power Seat 11 D is a standard Premiere Class seat. 11 G None No Power Seat 11 G is a standard Premiere Class seat. 11 K None No Power Seat 11 K is a standard Premiere Class seat. 12 A None No Power Seat 12 A is a standard Premiere Class seat. 12 D None No Power Seat 12 D is a standard Premiere Class seat. 12 G None No Power Seat 12 G is a standard Premiere Class seat. 12 K None No Power Seat 12 K is a standard Premiere Class seat. 14 A None No Power Seat 14 A is a standard Premiere Class seat. 14 D None No Power Seat 14 D is a standard Premiere Class seat. 14 G None No Power Seat 14 G is a standard Premiere Class seat. 14 K None No Power Seat 14 K is a standard Premiere Class seat. 15 A None No Power Seat 15 A is a standard Premiere Class seat. 15 D None No Power Seat 15 D is a standard Premiere Class seat. 15 G None No Power Seat 15 G is a standard Premiere Class seat. 15 K None No Power Seat 15 K is a standard Premiere Class seat. 16 A None No Power Seat 16 A is a standard Premiere Class seat. 16 D None No Power Seat 16 D is a standard Premiere Class seat. 16 G None No Power Seat 16 G is a standard Premiere Class seat. 16 K None No Power Seat 16 K is a standard Premiere Class seat. 26 A None No Power Seat 26 A is a standard Economy Class seat that has extra legroom. Passengers may enjoy this Economy Class seat more than others due to the privacy of this smaller Economy Class cabin. There is no floor storage for this seat during take-off and landing. The tray table is in the armrest, making the armrest immovable and slightly reducing seat width. 26 B None No Power Seat 26 B is a standard Economy Class seat that has extra legroom. Passengers may enjoy this Economy Class seat more than others due to the privacy of this smaller Economy Class cabin. There is no floor storage for this seat during take-off and landing. The tray table is in the armrest, making the armrest immovable and slightly reducing seat width. 26 C None No Power Seat 26 C is a standard Economy Class seat that has extra legroom. Passengers may enjoy this Economy Class seat more than others due to the privacy of this smaller Economy Class cabin. There is no floor storage for this seat during take-off and landing. The tray table is in the armrest, making the armrest immovable and slightly reducing seat width. 26 D None No Power Seat 26 D is a standard Economy Class seat that has extra legroom. Passengers may enjoy this Economy Class seat more than others due to the privacy of this smaller Economy Class cabin. There is no floor storage for this seat during take-off and landing. The tray table is in the armrest, making the armrest immovable and slightly reducing seat width. 26 E None No Power Seat 26 E is a standard Economy Class seat that has extra legroom. Passengers may enjoy this Economy Class seat more than others due to the privacy of this smaller Economy Class cabin. There is no floor storage for this seat during take-off and landing. The tray table is in the armrest, making the armrest immovable and slightly reducing seat width. 26 F None No Power Seat 26 F is a standard Economy Class seat that has extra legroom. Passengers may enjoy this Economy Class seat more than others due to the privacy of this smaller Economy Class cabin. There is no floor storage for this seat during take-off and landing. The tray table is in the armrest, making the armrest immovable and slightly reducing seat width. 26 G None No Power Seat 26 G is a standard Economy Class seat that has extra legroom. Passengers may enjoy this Economy Class seat more than others due to the privacy of this smaller Economy Class cabin. There is no floor storage for this seat during take-off and landing. The tray table is in the armrest, making the armrest immovable and slightly reducing seat width. 26 H None No Power Seat 26 H is a standard Economy Class seat that has extra legroom. Passengers may enjoy this Economy Class seat more than others due to the privacy of this smaller Economy Class cabin. There is no floor storage for this seat during take-off and landing. The tray table is in the armrest, making the armrest immovable and slightly reducing seat width. 26 J None No Power Seat 26 J is a standard Economy Class seat that has extra legroom. Passengers may enjoy this Economy Class seat more than others due to the privacy of this smaller Economy Class cabin. There is no floor storage for this seat during take-off and landing. The tray table is in the armrest, making the armrest immovable and slightly reducing seat width. 26 K None No Power Seat 26 K is a standard Economy Class seat that has extra legroom. Passengers may enjoy this Economy Class seat more than others due to the privacy of this smaller Economy Class cabin. There is no floor storage for this seat during take-off and landing. The tray table is in the armrest, making the armrest immovable and slightly reducing seat width. 27 A None No Power Seat 27 A is a standard Economy Class seat. Passengers may enjoy this Economy Class seat more than others due to the privacy of this smaller Economy Class cabin. 27 B None No Power Seat 27 B is a standard Economy Class seat. Passengers may enjoy this Economy Class seat more than others due to the privacy of this smaller Economy Class cabin. 27 C None No Power Seat 27 C is a standard Economy Class seat. Passengers may enjoy this Economy Class seat more than others due to the privacy of this smaller Economy Class cabin. 27 D None No Power Seat 27 D is a standard Economy Class seat. Passengers may enjoy this Economy Class seat more than others due to the privacy of this smaller Economy Class cabin. 27 E None No Power Seat 27 E is a standard Economy Class seat. Passengers may enjoy this Economy Class seat more than others due to the privacy of this smaller Economy Class cabin. 27 F None No Power Seat 27 F is a standard Economy Class seat. Passengers may enjoy this Economy Class seat more than others due to the privacy of this smaller Economy Class cabin. 27 G None No Power Seat 27 G is a standard Economy Class seat. Passengers may enjoy this Economy Class seat more than others due to the privacy of this smaller Economy Class cabin. 27 H None No Power Seat 27 H is a standard Economy Class seat. Passengers may enjoy this Economy Class seat more than others due to the privacy of this smaller Economy Class cabin. 27 J None No Power Seat 27 J is a standard Economy Class seat. Passengers may enjoy this Economy Class seat more than others due to the privacy of this smaller Economy Class cabin. 27 K None No Power Seat 27 K is a standard Economy Class seat. Passengers may enjoy this Economy Class seat more than others due to the privacy of this smaller Economy Class cabin. 28 A None No Power Seat 28 A is a standard Economy Class seat. Passengers may enjoy this Economy Class seat more than others due to the privacy of this smaller Economy Class cabin. 28 B None No Power Seat 28 B is a standard Economy Class seat. Passengers may enjoy this Economy Class seat more than others due to the privacy of this smaller Economy Class cabin. 28 C None No Power Seat 28 C is a standard Economy Class seat. Passengers may enjoy this Economy Class seat more than others due to the privacy of this smaller Economy Class cabin. 28 D None No Power Seat 28 D is a standard Economy Class seat. Passengers may enjoy this Economy Class seat more than others due to the privacy of this smaller Economy Class cabin. 28 E None No Power Seat 28 E is a standard Economy Class seat. Passengers may enjoy this Economy Class seat more than others due to the privacy of this smaller Economy Class cabin. 28 F None No Power Seat 28 F is a standard Economy Class seat. Passengers may enjoy this Economy Class seat more than others due to the privacy of this smaller Economy Class cabin. 28 G None No Power Seat 28 G is a standard Economy Class seat. Passengers may enjoy this Economy Class seat more than others due to the privacy of this smaller Economy Class cabin. 28 H None No Power Seat 28 H is a standard Economy Class seat. Passengers may enjoy this Economy Class seat more than others due to the privacy of this smaller Economy Class cabin. 28 J None No Power Seat 28 J is a standard Economy Class seat. Passengers may enjoy this Economy Class seat more than others due to the privacy of this smaller Economy Class cabin. 28 K None No Power Seat 28 K is a standard Economy Class seat. Passengers may enjoy this Economy Class seat more than others due to the privacy of this smaller Economy Class cabin. 29 A None No Power Seat 29 A is a standard Economy Class seat whose close proximity to the lavatories may be bothersome. 29 B None No Power Seat 29 B is a standard Economy Class seat whose close proximity to the lavatories may be bothersome. 29 C None No Power Seat 29 C is a standard Economy Class seat whose close proximity to the lavatories may be bothersome. 29 D None No Power Seat 29 D is a standard Economy Class seat whose close proximity to the lavatories may be bothersome. 29 E None No Power Seat 29 E is a standard Economy Class seat whose close proximity to the lavatories may be bothersome. 29 F None No Power Seat 29 F is a standard Economy Class seat whose close proximity to the lavatories may be bothersome. 29 G None No Power Seat 29 G is a standard Economy Class seat whose close proximity to the lavatories may be bothersome. 29 H None No Power Seat 29 H is a standard Economy Class seat whose close proximity to the lavatories may be bothersome. 29 J None No Power Seat 29 J is a standard Economy Class seat whose close proximity to the lavatories may be bothersome. 29 K None No Power Seat 29 K is a standard Economy Class seat whose close proximity to the lavatories may be bothersome. 30 D None No Power Seat 30 D is a standard Economy Class seat that may have restricted legroom due to the proximity of the bulkhead. In addition the close proximity to the lavatories may be bothersome. Passengers traveling with infants are often seated in this row. There is no floor storage for this seat during take-off and landing. The tray table is in the armrest, making the armrest immovable and slightly reducing seat width. 30 E None No Power Seat 30 E is a standard Economy Class seat that may have restricted legroom due to the proximity of the bulkhead. In addition the close proximity to the lavatories may be bothersome. Passengers traveling with infants are often seated in this row. There is no floor storage for this seat during take-off and landing. The tray table is in the armrest, making the armrest immovable and slightly reducing seat width. 30 F None No Power Seat 30 F is a standard Economy Class seat that may have restricted legroom due to the proximity of the bulkhead. In addition the close proximity to the lavatories may be bothersome. Passengers traveling with infants are often seated in this row. There is no floor storage for this seat during take-off and landing. The tray table is in the armrest, making the armrest immovable and slightly reducing seat width. 30 G None No Power Seat 30 G is a standard Economy Class seat that may have restricted legroom due to the proximity of the bulkhead. In addition the close proximity to the lavatories may be bothersome. Passengers traveling with infants are often seated in this row. There is no floor storage for this seat during take-off and landing. The tray table is in the armrest, making the armrest immovable and slightly reducing seat width. 31 A None No Power Seat 31 A is an Economy Class Exit Row seat that may have extra legroom however people often tend to congregate in this area. The close proximity to the lavatories may be bothersome. The tray table is in the armrest, making the armrest immovable and slightly reducing seat width. There may be no floor storage during take-off and landing. 31 B None No Power Seat 31 B is an Economy Class Exit Row seat that may have extra legroom however people often tend to congregate in this area. The close proximity to the lavatories may be bothersome. The tray table is in the armrest, making the armrest immovable and slightly reducing seat width. There may be no floor storage during take-off and landing. 31 C None No Power Seat 31 C is an Economy Class Exit Row seat that may have extra legroom however people often tend to congregate in this area. The close proximity to the lavatories may be bothersome. The tray table is in the armrest, making the armrest immovable and slightly reducing seat width. There may be no floor storage during take-off and landing. 31 H None No Power Seat 31 H is an Economy Class Exit Row seat that may have extra legroom however people often tend to congregate in this area. The close proximity to the lavatories may be bothersome. The tray table is in the armrest, making the armrest immovable and slightly reducing seat width. There may be no floor storage during take-off and landing. 31 J None No Power Seat 31 J is an Economy Class Exit Row seat that may have extra legroom however people often tend to congregate in this area. The close proximity to the lavatories may be bothersome. The tray table is in the armrest, making the armrest immovable and slightly reducing seat width. There may be no floor storage during take-off and landing. 31 K None No Power Seat 31 K is an Economy Class Exit Row seat that may have extra legroom however people often tend to congregate in this area. The close proximity to the lavatories may be bothersome. The tray table is in the armrest, making the armrest immovable and slightly reducing seat width. There may be no floor storage during take-off and landing. 44 D None No Power Seat 44 D is a standard Economy Class seat that may have limited recline. The close proximity to the galley may be bothersome. 44 E None No Power Seat 44 E is a standard Economy Class seat that may have limited recline. The close proximity to the galley may be bothersome. 44 F None No Power Seat 44 F is a standard Economy Class seat that may have limited recline. The close proximity to the galley may be bothersome. 44 G None No Power Seat 44 G is a standard Economy Class seat that may have limited recline. The close proximity to the galley may be bothersome. 45 A None No Power Seat 45 A is an Economy Class seat that may have limited recline. The close proximity to the galley may be bothersome. 45 B None No Power Seat 45 B is an Economy Class seat that may have limited recline. The close proximity to the galley may be bothersome. 45 C None No Power Seat 45 C is an Economy Class seat that may have limited recline. The close proximity to the galley may be bothersome. 45 H None No Power Seat 45 H is an Economy Class seat that may have limited recline. The close proximity to the galley may be bothersome. 45 J None No Power Seat 45 J is an Economy Class seat that may have limited recline. The close proximity to the galley may be bothersome. 45 K None No Power Seat 45 K is an Economy Class seat that may have limited recline. The close proximity to the galley may be bothersome. 50 A None No Power Seat 50 A is an Economy Class seat that has additional legroom due to the Exit Row, however, the proximity to the galley may be bothersome. The tray table is in the armrest making the armrest immovable and slightly reducing seat width. 50 B None No Power Seat 50 B is an Economy Class seat that has additional legroom due to the Exit Row, however, the proximity to the galley may be bothersome. The tray table is in the armrest making the armrest immovable and slightly reducing seat width. 50 C None No Power Seat 50 C is an Economy Class seat that has additional legroom due to the Exit Row, however, the proximity to the galley may be bothersome. The tray table is in the armrest making the armrest immovable and slightly reducing seat width. 50 H None No Power Seat 50 H is an Economy Class seat that has additional legroom due to the Exit Row, however, the proximity to the galley may be bothersome. The tray table is in the armrest making the armrest immovable and slightly reducing seat width. 50 J None No Power Seat 50 J is an Economy Class seat that has additional legroom due to the Exit Row, however, the proximity to the galley may be bothersome. The tray table is in the armrest making the armrest immovable and slightly reducing seat width. 50 K None No Power Seat 50 K is an Economy Class seat that has additional legroom due to the Exit Row, however, the proximity to the galley may be bothersome. The tray table is in the armrest making the armrest immovable and slightly reducing seat width. 52 D None No Power Seat 52 D is a standard Economy Class seat whose proximity to the galley may be bothersome. 52 E None No Power Seat 52 E is a standard Economy Class seat whose proximity to the galley may be bothersome. 52 F None No Power Seat 52 F is a standard Economy Class seat whose proximity to the galley may be bothersome. 52 G None No Power Seat 52 G is a standard Economy Class seat whose proximity to the galley may be bothersome. 58 C None No Power Seat 58 C is an Economy Class seat that juts out into the aisle and may be bumped into. 58 H None No Power Seat 58 H is an Economy Class seat that juts out into the aisle and may be bumped into. 59 A None No Power Seat 59 A is a standard Economy Class seat that may have slightly restricted legroom due to the misalignment of the row ahead. 59 B None No Power Seat 59 B is a standard Economy Class seat that may have slightly restricted legroom due to the misalignment of the row ahead. 59 J None No Power Seat 59 J is a standard Economy Class seat that may have slightly restricted legroom due to the misalignment of the row ahead. 59 K None No Power Seat 59 K is a standard Economy Class seat that may have slightly restricted legroom due to the misalignment of the row ahead. 62 B None No Power Seat 62 B is a standard Economy Class seat whose proximity to the lavatory may be bothersome. 62 D None No Power Seat 62 D is a standard Economy Class seat in the last row of the aircraft and whose proximity to the lavatory may be bothersome. 62 E None No Power Seat 62 E is a standard Economy Class seat in the last row of the aircraft and whose proximity to the lavatory may be bothersome. 62 F None No Power Seat 62 F is a standard Economy Class seat in the last row of the aircraft and whose proximity to the lavatory may be bothersome. 62 G None No Power Seat 62 G is a standard Economy Class seat in the last row of the aircraft and whose proximity to the lavatory may be bothersome. 62 H None No Power Seat 62 H is a standard Economy Class seat whose proximity to the lavatory may be bothersome. 63 A None No Power Seat 63 A is a standard Economy Class seat in the last row of the aircraft and whose proximity to the lavatory may be bothersome. 63 B None No Power Seat 63 B is a standard Economy Class seat in the last row of the aircraft and whose proximity to the lavatory may be bothersome. 63 H None No Power Seat 63 H is a standard Economy Class seat in the last row of the aircraft and whose proximity to the lavatory may be bothersome. 63 K None No Power Seat 63 K is a standard Economy Class seat in the last row of the aircraft and whose proximity to the lavatory may be bothersome. 8 D None No Power Seat 8 D is a standard Premiere Class seat. 8 G None No Power Seat 8 G is a standard Premiere Class seat. 9 A None No Power Seat 9 A is a standard Premiere Class seat. 9 D None No Power Seat 9 D is a standard Premiere Class seat. 9 G None No Power Seat 9 G is a standard Premiere Class seat. 9 K None No Power Seat 9 K is a standard Premiere Class seat. Each First and Premiere class seat has a 110v AC power port. Shared power ports are available between the economy seats. Jet Airways is operating the Boeing 777-300ER on long-haul flights. There are two versions of this aircraft: This is Version 2 and it has a 3-4-3 configuration in the Economy Class. The seats may feel more cramped than in Version 1 which features a 3-3-3 configuration in the Economy Class. This aircraft flies with 8 seats in First Class, 30 seats in Business Class, and 308 seats in Economy. All seats are equiped with Personal TVs and AC power ports. In the Economy Class, the AC power ports are shared between seats. Jet Airways - a former shadow of its past now, this was a great airline surpassing its rivals on this route. Check in at Mumbai, only two counters open, staff engaged in own chats until manager arrives and four more counters open up. Before you board the plane your boarding card will be chad on 5 occasions, two by security and immigration and 3 just before boarding (whats this about). Seat leave a lot to be desired, our seats wouldn't recline, I.C.E. was good, food was awful and portions small, The red wine served from a standard sized bottle had oxidised (probably from the previous flight) seat space is too cramped to eat. Cabin staff not very sparse (I'm sure there were more on my previous trips). Jet app a waste of time, didn't work for check in or on the plane. We certainly won't be using Jet airlines again for our travels. To be clear, every economy seat on the Jet Airways 777-300ER plane is awfully uncomfortable. The seat cushion is extremely thin and this is really quite nasty after 7-8 hours. In addition the 3-4-3 configuration rather than 3-3-3 means that the seat width is reduced compared to other 777 variants making it even more uncomfortable. Overall I cannot recommend this airline based on the size and comfort factor of the seats. 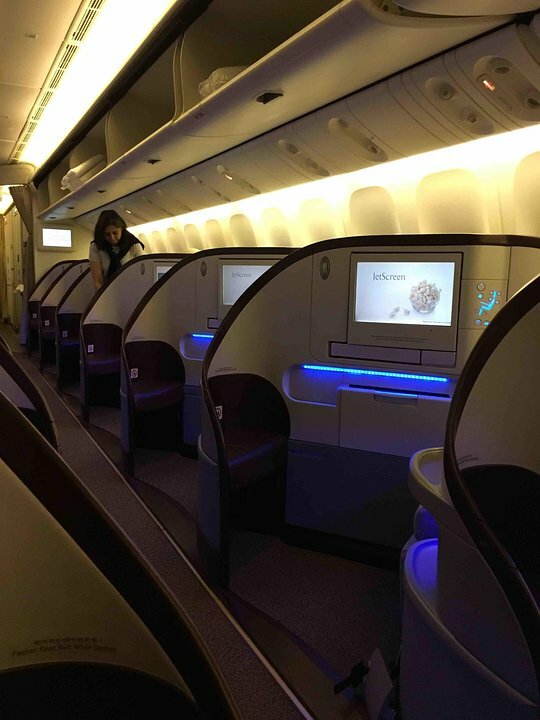 This seat is standard business seat but the great advantage of the side seats (A and K) compared to the seats in center of the cabin (D and G) is that you actually have a bit of extra room in length when the seat is fully flat. I asked a few additional pillows to the crew to "extend" my bed in length (I am 1m95). 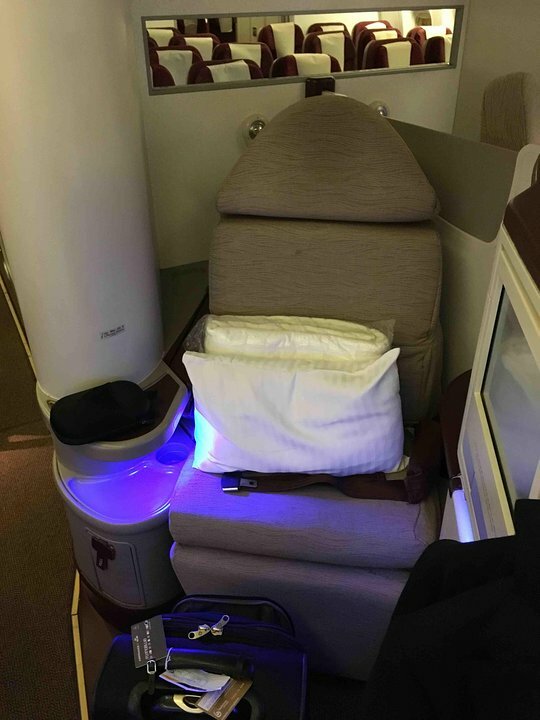 I spent one of the best nights on board of a long haul flight thanks to that. Pijamas are definitely a great experience. Too close to the entrance and pantry/toilets, so upon boarding all economy passengers pass this chair + during flight a lot of movement of people. Had seat 16D Premiere Class for Toronto to AMS to Delhi. I liked the seat since it had a wall that gave you added privacy when you fully reclined. The attendant used a closet on other side of wall periodically which added a little noise, but it was offset by the ability to access him/her for food or drink requests without ringing bell etc. We flew YYZ-AMS on 12/20/17 and back on 30/20/17. The seat was very spacious although a little hard. The food was very good and the service exceptional. Definitely I will use Jet Airways again. One of the best business class airline!!! (AMS - YYZ) You have a bit of extra legroom for 26k, even 31k isn't that bad. But the seats of the aircraft are hard not fit for a long haul. I had severe pain and had to constantly get up every 15 mins in order to keep my sanity. The aircraft is old, the maintenance is bad, the crew is overworked and it shows. Never going to fly Jet International anymore. A crapy old Boeing 777-300ER, old hard seats, no leg room, resulting in legs getting cramped on a flight of 8:30hours. Lunch was served after take off, and after 7 hours, just before landing in Mumbai, a snack was served. when drinks were served, I was told all they had to drink was red label, an Indian rum called Old monk. No beer available. Pathetic. This was my first flight, and well could be my last, as I will avoid flying Jet Airways. This may be a general issue with Boeing 777-300 ER aircraft or specific to Jet Airways (I am not sure) - If you are tall, and hence need more legroom and if you have to travel in Economy Class in this 777-300 ER Aircraft (I flew Mumbai-Singapore), please DO NOT select any Window or Aisle seat in Row 38. I got Seat 38 A and I had to rest my feet at an "angle" since there was something below the seat in front of me (37A) which prevented me from keeping my legs straight. Very uncomfortable for a tall person like me. I could see that even the Aisle seat 38C had a similar issue, but at least if you are in an aisle seat you can stretch your legs more comfortably. Jet Airways flies 1 versions of Boeing 777-300ER.